Neil J. Zemmel, MD, FACS details the various reasons why patients may seek a breast implant revision for their initial augmentation results. 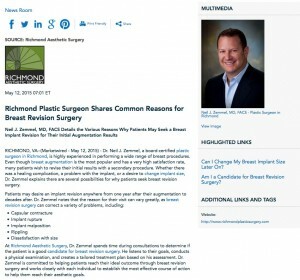 Richmond, VA – Dr. Neil J. Zemmel, a board-certified plastic surgeon in Richmond, is highly experienced in performing a wide range of breast procedures. Even though breast augmentation is the most popular and has a very high satisfaction rate, many patients wish to revise their initial results with a secondary procedure. Whether there was a healing complication, a problem with the implant, or a desire to change implant size, Dr. Zemmel explains there are several possibilities for why patients seek breast revision surgery. At Richmond Aesthetic Surgery, Dr. Zemmel spends time during consultations to determine if the patient is a good candidate for breast revision surgery. He listens to their goals, conducts a physical examination, and creates a tailored treatment plan based on his assessment. Dr. Zemmel is committed to helping patients reach their ideal outcome through breast revision surgery and works closely with each individual to establish the most effective course of action to help them reach their aesthetic goals. Dr. Zemmel recommends anyone unhappy with their breast augmentation results, or who desires an upgrade, to consult with a board-certified plastic surgeon who is experienced with performing the procedure to achieve optimal results. Dr. Zemmel is a board-certified plastic and reconstructive surgeon, offering a wide range of procedures to patients of Richmond Aesthetic Surgery. After graduating from the College of William and Mary in Williamsburg, Virginia, he earned his medical degree from the University of Virginia. Dr. Zemmel then continued to the Virginia Commonwealth University Medical Center in Richmond for the competitive 6-year plastic and general surgery program. He remains active in the medical community as a member of the American Society for Aesthetic Plastic Surgery and the American Society of Plastic Surgeons, as well as a Fellow of the American College of Surgeons. Dr. Zemmel is available for interview upon request.